Ok, so a friend asked me a question via Facebook (gotta love it) and I thought the conversation was worth sharing. Okay so my question may seem a bit out of left field but if you lived here (in my mind) too you'd understand its been hanging around for a while. However, it's been brought to my utmost attention by the caliber of classes I'm taking this semester; an anthropology class, a geology class, and a child development. (The child development class has nothing to do with it.) There is a lot of talk about our planet's million years of history and all that happened therein, and I recall (at least i think it was you) saying something about the account of creation in Genisis mimicking poems found later in the Bible and that it might actually be more symbolic than anything, and so basically I'm just wondering what you know and believe about Creationism vs. Evolution and how, if at all, you marry the two? Genesis 1 is a poem. Of this I am convinced. In 1884 Charles A. Briggs, professor at Union Theological Seminary and Biblical scholarship legend, wrote a beautiful little article entitled "The Hebrew Poem of The Creation" arguing brilliantly and convincingly that Genesis chapter 1 is indeed a poem. So this is nothing new and I know that Briggs' is not the only article of its kind (but it might be the best... I can send you the article if you want). Genesis 1 was written in a world free from the presuppositions of modern science so its closest relatives are indeed other poems. Briggs compares the passage, part by part, with the Ancient Assyrian creation poem (Enûma Eliš)--pointing out striking differences and resemblances along the way--and with the 104th Psalm. The Enûma Eliš is similar enough to Genesis 1 that we can assume that the author would have been familiar with it and was therefore writing in contrast to it (even if not specifically). He or she is giving an alternative creation account to offer a different and indeed a more hopeful perspective on God and God's relationship to creation. Rather than being the product of violent warfare among the gods, rather than being made from the blood of an evil goddess, creation in Genesis 1 is good and it is produced out of obedience to the One God. Man is not created to serve the gods but to reflect the image of the one God. God is not self-interested but indeed the one God of Genesis 1 delights in the goodness of his creation--created in peace by the spoken word. Thus Genesis 1, in its ancient context, would have been a beautifully fresh perspective--the perfect foundation for faith in a God or covenant faithfulness and loving kindness. The 104th Psalm, rather than being a descriptive poem, is a poem of praise to God for his creativity. This song of praise reflects the hopefulness of the biblical perspective of creation. God is praised for goodness rather than out of fear. Psalm 104 actually follows a similar pattern to that of Genesis 1, going from light, to waters & land, to creatures, etc. These two poems are indeed kin to one another. In its poetic form, the passage "rises up in its majestic grandeur above all the conflicts of human opinion" (Briggs). In other words, rather than taking sides in the creation vs evolution debate, Genesis 1 actually transcends the whole argument, refusing to be interpreted merely as an historical or scientific account. It's after something bigger than just a description of how it was done or how old the earth is or how long it took to be created. Those questions aren't even on the radar of the author. What he or she is really after is a radically refreshing proclamation of who God is and what creation is like. The point is not that it was created in six days but that it is good and that the God who, in freedom and creativity, called it into order actually delights in his creation, especially in those whom he created to bear his image in creation (that's us!). So, since the bible seems to transcend the argument of creation vs. evolution, I guess I try to as well. Since the Genesis 1 in particular seems to be talking about something more important, I try to as well. If scientists say that the earth is billions of years on (which makes sense to me) then I'll take that on authority. It seems that the only scientists who challenge that conclusion are not without a religious agenda which defies the rules of science (not that I personally feel bound to those rules). Now, scientists who oppose the idea of intelligent design with militant dispositions seem to have an agenda as well. Science should be quite open to the idea of intelligent design and, by the rules of science, should simply wait for evidence. But building a scientific conclusion is different from building a religious faith. Following Jesus is not about objectivity or waiting for evidence. It's about taking the risk of failure and immersing yourself in a radically different kind of life, worshiping a radically loving God. The truth is that neither the scientist nor the religious person can be certain of much... science changes and God is bigger than our intellectual capacity. So, since the playing ground is pretty much even, we have to ask what's the best possible way to live? In what or whom can we place our hope? And we simply have to taste and see that the Lord is good. To answer your question... I don't have an opinion about how old the earth is and I don't marry science and religion but I can accept all truth as God's truth. If the earth is billions of years old, I can accept that and it doesn't change much in terms of who God is and what creation is supposed to be like. Does this help? Even a little? I've been asked enough times about the relationship between science and religion to know that I'm not the best guy to ask. My views are always changing and shifting. Whatever the case, the relationship is a conflicted one in which there are numerous inconsistencies and huge misunderstandings. But overall, I think writing my response to Ashley helped me formulate, once again, some thoughts that help me. Hey, maybe you can help me out here. Can you send me that article? I've read before that Genesis 1 resembles the Enuma Elish, so once the internet age came, I looked up the Enuma Elish. I didn't see the resemblance at all. So if Briggs' article compares the two, it would be a great help for me. I signed is as name and URL rather than with Google. You may enjoy the site anyway. But if you could use the contact me form there, I'll email you my email address so that I don't have to post it here. I completely agree. I don't understand Modern Science as much as I would like to, but I don't see how so many Scientists would try and come up with something fake to please their own thoughts. They are pretty darn smart and have studied for many years anyway. I have always thought that the important part about Genesis 1 was the fact that God created it. I don't care how He did it, but just that He did. This is your first Blog I have ever read by the way. I am going to do this more often. I'll be glad to send you that article. I will do it soon! I think you'll enjoy it and I hope it helps. I'm glad you got around to reading my blog. Thanks and keep reading. This helped. A LOT. It was a hard few weeks of school, seeing evidence for evolution that was definitely ...impossible to refute. I was left with the question of "What does this mean for me and my faith?" And after reading your response the answer I came up with was, satisfactorily, "Nothing". And as I further read through science books, listened to lectures, keeping my heart open before God, I felt no opposition. I felt more awe towards God, in a way, that he could surpass all of our assumptions and limitations and expectations. What's funny is that He always does that; and every time I'm amazed. 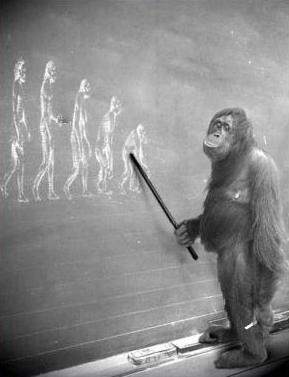 My Anthropology class went into depth over this one Tuesday, mapping out all the different variations of Evolution and Creationism, and what my teacher arrived at was that if you take one without the other, both seem to have question marks hanging everywhere. Its when you meld them together that you get the answers that make the most scientific sense. And, as I've seen, the most "religious" sense as well. He also, allbeit gently, put down the scientists who would claim there is definitely no God, who definitely didn't create or have something to do with the world. Saying unless something can be disproven, a scientist has now right to say it isn't so. Anyways. I thought it was refreshing to hear a scientist say such a thing. Thank you so much for your help, Wes! I'd like a copy of the article too, when you have time! No rush. It's funny. Yesterday, I heard a strict Biblical literalist, not realizing what he was saying, mention some situation and comment, "Like everything else, it evolved, and now it's not the same." Right, everything about life and even about following Christ testifies that we change by evolution. Bit by bit, adversity, tribulation, and death produce change, advancement, and life. Evolution doesn't refute God; it's a glorious testimony to his nature and how we grow even spiritually. "Death works in us, but life in you."